The future of drum corps? Elementary, my dear Watson! Ken Jennings and Brad Rutter are still trying to get the license plate of the supercomputer that ran over them last week, when the two most successful champions in "Jeopardy" history were blindsided by Watson, the IBM supercomputer that taught them a thing or two about human fallibility. "I for one welcome our new computer overlords," wrote Jennings as he filled out his Final Jeopardy answer, knowing that Watson had probably taken him to the woodshed, (or wherever computers go to gloat over their vanquished adversaries). In a CNN article about the "Jeopardy" showdown, Jason Hanna wrote, " IBM trumpets Watson as a machine that can rival a human's ability to answer questions posed in natural human language." Note the use of the word, "trumpets." 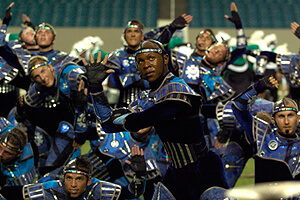 Now that trumpets have replaced soprano bugles as the lead line in drum corps arrangements, is it just a matter of time before Watson's brethren descend upon drum corps stadiums to demonstrate their superiority to feeble-albeit-better tanned human corps members? Have we opened the door by allowing amps and electronics? How many years before we hear the following bellow forth from the Lucas Oil public address system; "All your amps are belong to us"? Well, that time may be closer than we think. Not only do we have robots that can win against the brightest minds in "Jeopardy," but we also have robots that could some day replace humans on the drum corps field. Not content to just give us the Prius, the Toyota Motor Corporation has presented to us the future of musical performance in the guise of four robotic beings that can play brass and percussion and also move around. Oh, you say that's stretching things a bit too far? Consider what you may have thought during DCI's formative years if someone told you drum corps would feature amplification and electronics, particularly synthesizers. Okay, you would have asked, "What's a synthesizer?" A supercomputer as powerful as Watson could figure out how to break into the home computer of a DCI drill writer and plant some drill maneuvers it wishes to see done on the field. The writer may finish up a few pages of drill one day, go to bed, and awake to find his drill forms have been improved by an electronic intruder. As an apology for breaking into his computer, the digital Watson disciple may leave a photo of DCI Hall of Fame member Marc Sylvester as the home computer's new screen saver. With robotic drummers, there is no such thing as an unplayable rudiment. Imagine a line of snare drummers with robotic arms all playing in perfect sequence. Now imagine what those drummers will do to the on-board automobile computer of the Percussion Performance judge's car if they don't get the highest score. The judge could be driving down the street when suddenly, for no apparent reason, his car accelerates to a speed of 160 mph and wipes out a nearby Taco Bell. Robotic horn players will never get tired lips. The extreme high notes will always be executed to perfection. Anyone claiming to have played the highest trumpet note ever will be forced to admit that something other than themselves had definitively "Watsoned it," the new term that will be universally utilized to describe artistic and musical perfection. In addition, robots don't need medicated lip ointment. Computer romances would take on a new meaning as the color guard from one corps falls in love with the snare line of another corps. Digital love notes in the form of zeros and ones would be sent out during the performances of each of the corps. No one in the stands would know what was going on, but the tabulator's computer would be snickering to the point of soiling itself with a plethora of convulsive digital hiccups. Drum corps purists would wear T-shirts proclaiming, "Unplug the computers!" Here is all I will say to this: If you are on an upper level of Lucas Oil Stadium and there are two or more of those people waiting for an elevator, take the stairs. Michael Boo was a member of the Cavaliers from 1975-1977. He has written about the drum corps activity for more than a quarter century and serves as a staff writer for various Drum Corps International projects. Boo has written for numerous other publications and has published an honors-winning book on the history of figure skating.